A compliance checklist example is a specific set of questions used to test whether a product or service is compliant. Business executives often use these queries to test how a product or a specific service complies with specific standards, especially in areas that are usually difficult to test. Although product designers use the set of questions during the product design phase, it is highly unlikely that the questions will be similar for every product or service. 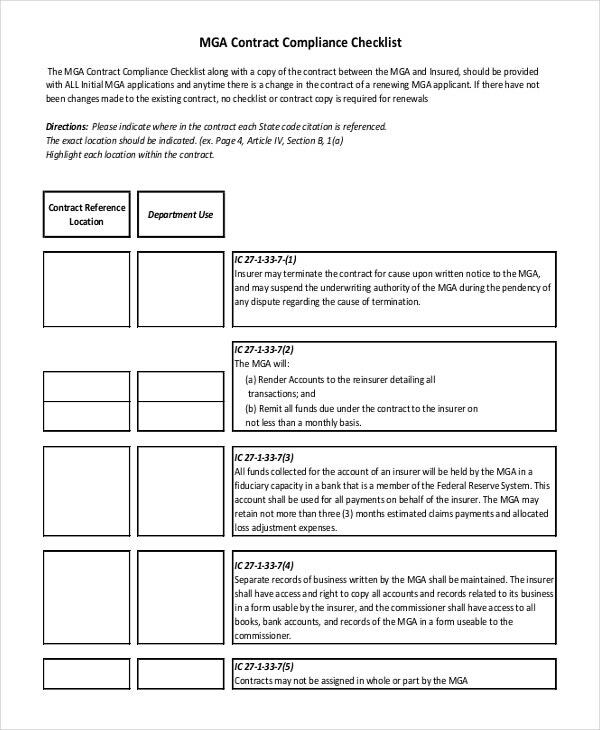 Of course, no business is designed similar, as such, a compliance Checklist Templates will, most likely, record varying, but significant results. 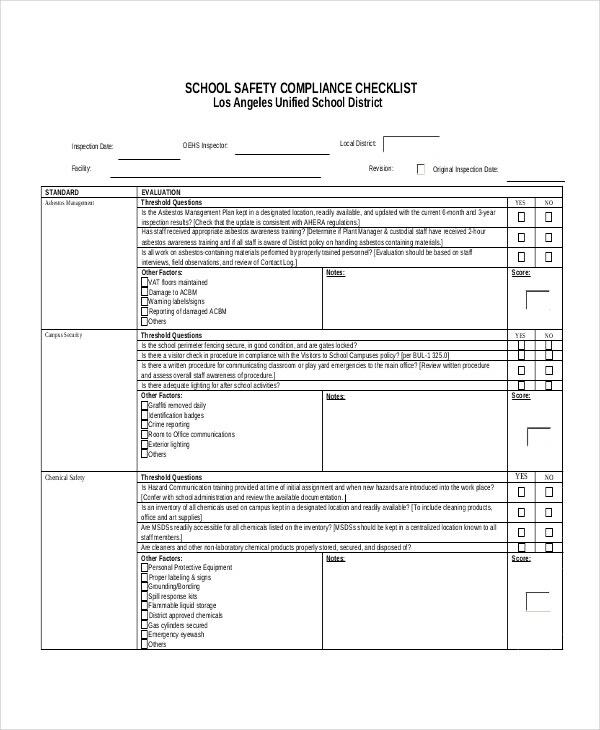 A legal compliance Checklist Templates outlines specific questions that will help to identify whether a process, an action, or a business can help to create a safety culture. 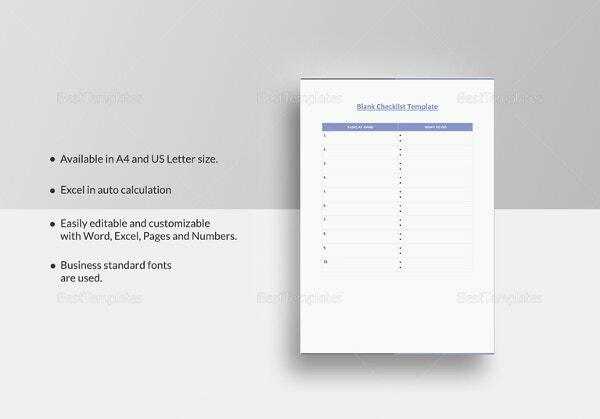 Download the template today, for free. A contract must have a set of rules to be regarded as legal. Whether it is a short-term deal or a long-term engagement, the parties engaged in the deal must answer a few questions beyond those already defined, and this list can provide the best compliance questions. The topic of environmental safety is far much wide. 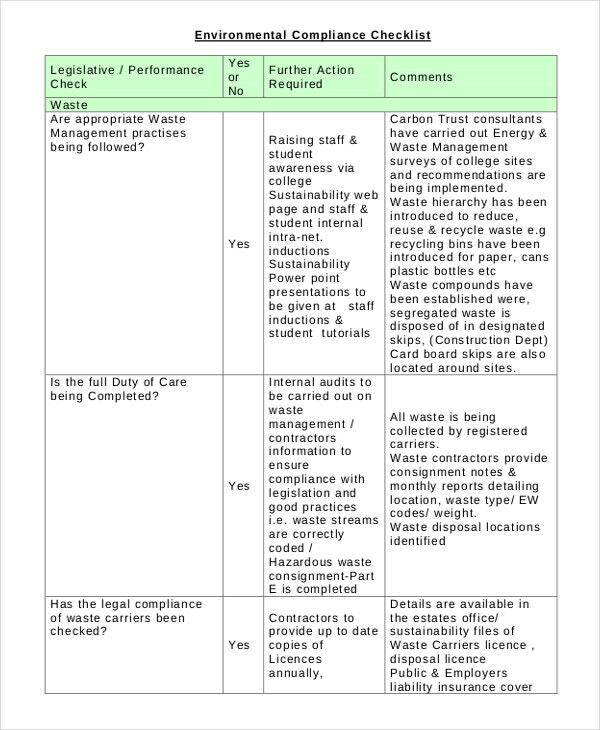 By creating a compliance list for environmental evaluation, you are able to answer only specific questions that require more attention. Use this template for help. 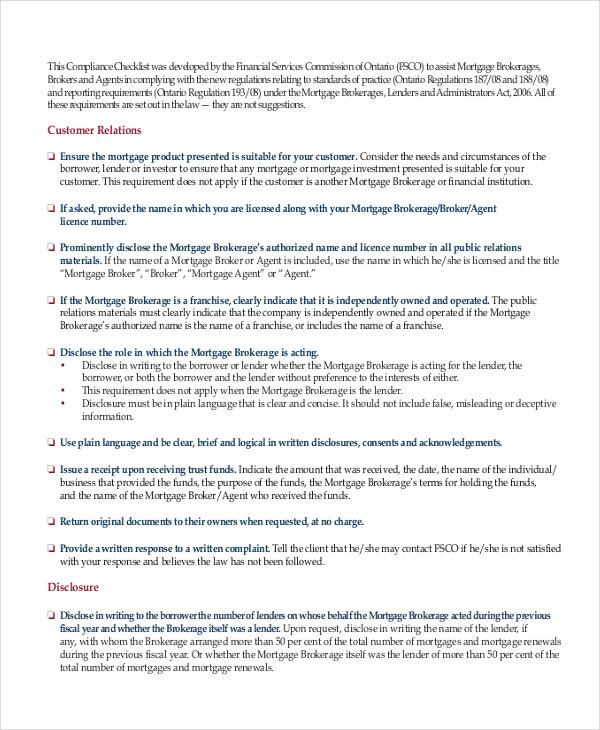 Do you want to sell a home but have no idea what rules to put in place to manage your mortgage? A compliance checklist can help. 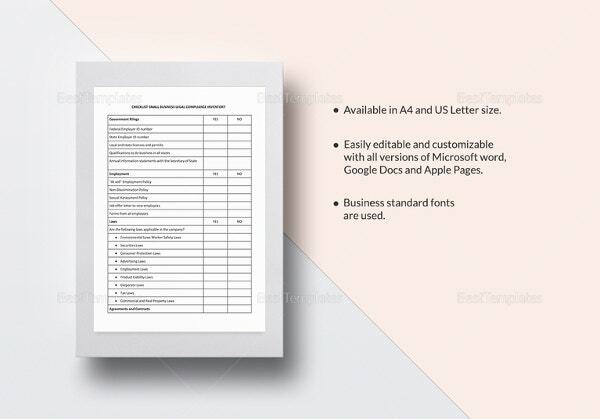 All you need to do is to download this template, and then you are good to go. 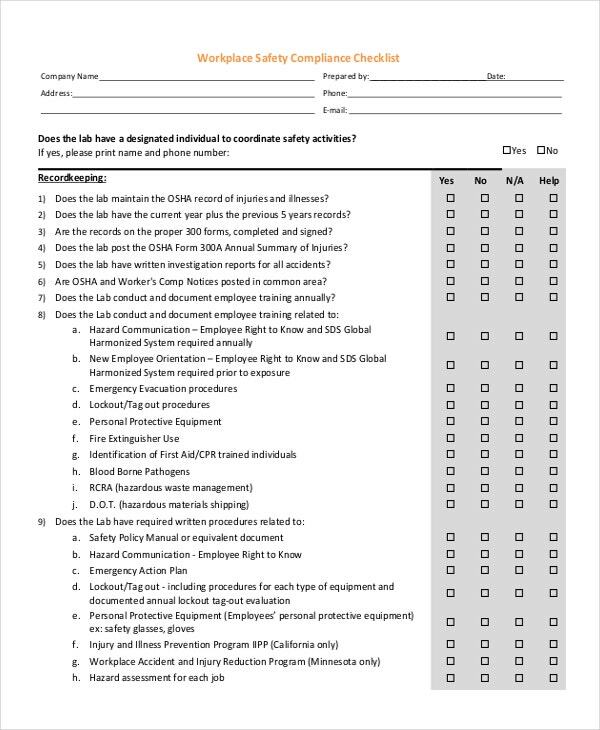 Safety Compliance Checklist Template ‘Be safe, always’. The statement is quite common owing to the significance of security. 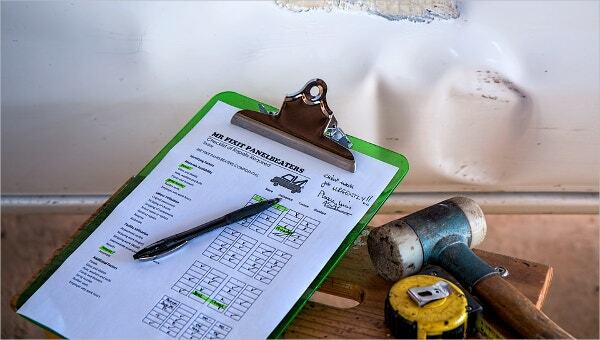 Why not put together a compliance checklist, and then use it as a guide to ensure security. Use this template for free, today! Doing anything without a compliance checklist is no different from dancing with death. For example, exactly how will you ensure environmental safety if you don’t have significant, relevant questions for the analysis? Of course, it is not going to be easy to achieve anything, and, as such, a compliance Checklist Templates for environmental safety is significant. 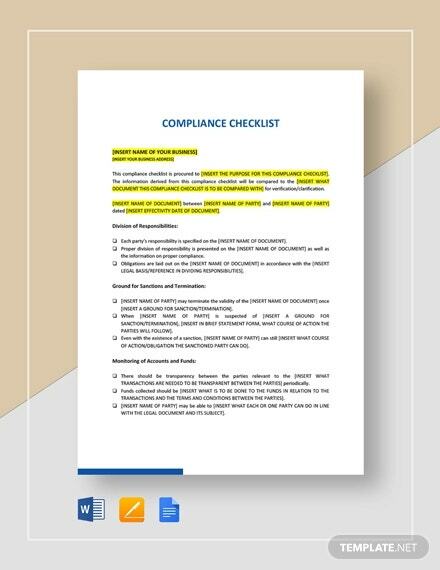 A compliance checklist will not only help you to promote a safety culture but also help you to consult with the right people on matters that concern health and safety. Businesses living in the dog’s age on the market often give compliance absolute relevance, for it is the best way to address occupational and societal safety. 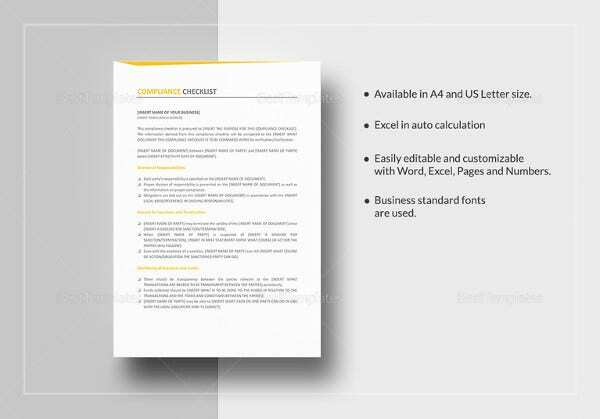 > What is the Best Standard Structure for a Compliance Checklist Template? A one-size-fits-all instruction manual for creating a standard compliance checklist template doesn’t exist. The only thing you probably need to know is that you can download any model from the web, and then use it as it is without editing the layout (design). 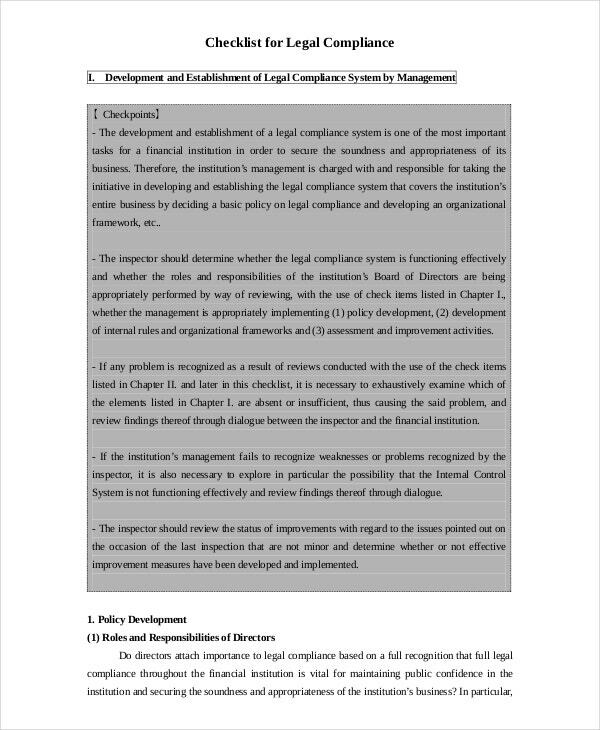 Today, many people prefer downloading the compliance checklist template, not because they do not have the skills required to design the template, but because they have little time to create the model. Even if you have enough time for the task, finding the task somewhat overwhelming is highly unlikely. 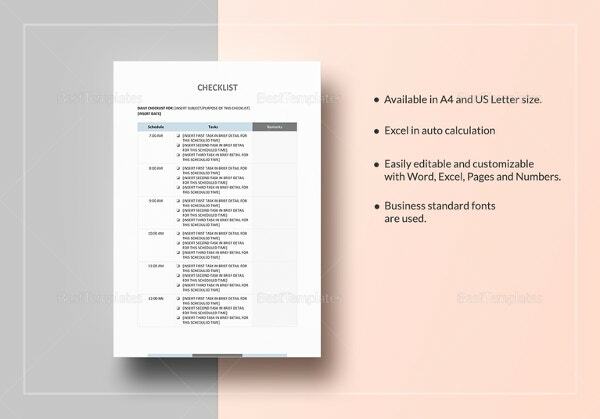 As there is no standard guide or rules for creating the template, you can create a checklist template in whichever way you want. 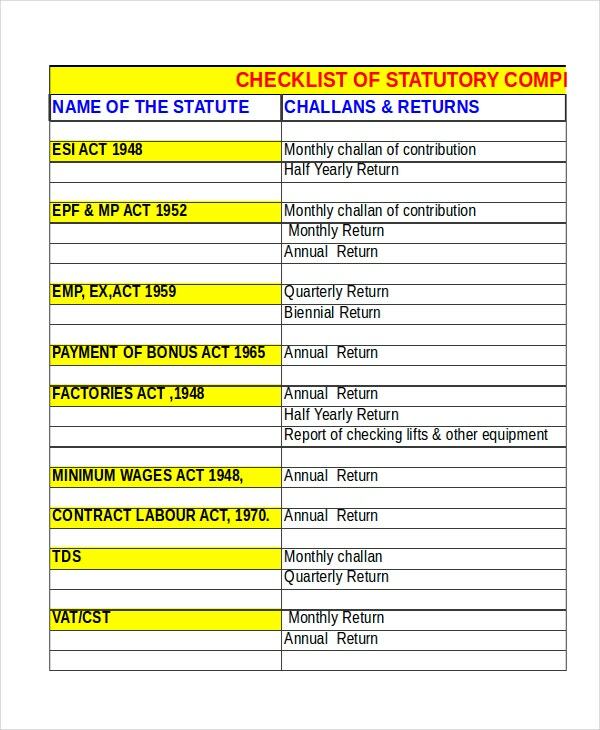 Your compliance questions and that of someone else will never be similar; it is therefore important to understand your topic before you create your compliance list. Once you have your topic, it is possible for you to stay focused on the topic without making mistakes. Relevance is almost always significant. Unless you are so serious about the compliance, it is going to be impossible for you to identify relevant issues. It is important to make products and services compliant, which means that a compliance list is a must have. If you have never created the outline before, this would probably be the best time to start one.